Most of the M4V videos downloaded from iTunes Store are DRM protected, so, you can not play these videos in Android phones or tablets. Even sharing of these files with other users are also limited due to DRM protection. To remove these limitations, Removal of DRM protection rights are must. Here, i review a tool called 'Noteburner M4V converter Plus for Mac' used for removal of DRM protection from M4V files. 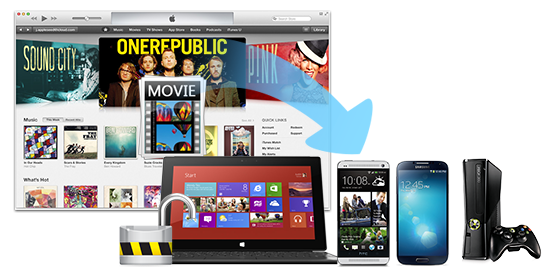 It is must for all the Mac users who want to remove DRM protection from M4V files and want to convert files to other formats like MP4, 3GP, AVI, WMV , MOV, MPEG, FLV, HTML5 etc. After removing limitations, you can use video files without any restriction and for any purpose. 1. Download Noteburner M4V converter Plus for Mac from here. 2. Add M4V movies by clicking on "+" button, by default it will open iTunes library, after selecting files, click 'OK'. 3. Adjust the video duration, choose video and audio track, you can even convert a selected portion of video and adjust duration accordingly. 4. Select output format, it supports various output formats like MP4, 3GP, AVI, WMV , MOV, MPEG, FLV, HTML5. 5. Adjust pro file settings like video and audio settings like Video codec, Video size, Video bitrate and audio bitrate. 6. Set output path and start converting M4V videos, click on 'Convert' , video will move into converting interface. Click on 'Start' button to convert M4V videos to desired format.